For other uses, see Ponta Delgada (disambiguation). 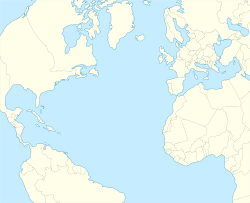 Ponta Delgada (Portuguese pronunciation: [ˈpõtɐ ˌðɛɫˈɣaðɐ]) is the largest municipality (concelho) and economic capital of the Autonomous Region of the Azores in Portugal. It is located on São Miguel Island, the largest and most populous in the archipelago. The population in 2011 was 68,809, in an area of 232.99 square kilometres (89.96 square miles). There are 17,629 residents in the three central civil parishes that comprise the historical city: São Pedro, São Sebastião, and São José. 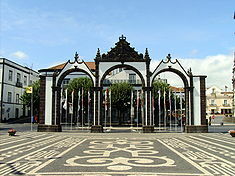 Ponta Delgada became the region's administrative capital under the revised constitution of 1976; the judiciary and Catholic see remained in the historical capital of Angra do Heroísmo while the Legislative Assembly of the Azores was established in Horta. In around 1450, Pêro de Teive, established a small fishing village that eventually grew into the urban agglomeration in Santa Clara. Populated since 1444, the island of São Miguel was a vast territory, with small settlements scattered about, except for Vila Franca do Campo in the central-southern coast, and the smaller community of Ponta Delgada. Villa Franca had for many years been the center of the island economically and socially, and seat of the local government, but many nobles and landed gentry despised its subordinate status to the government in that town (originating many conflicts between these inhabitants and administrators in the southern coast). The nobles in Ponta Delgada sent a secret contingent, headed by Fernão Jorge Velho, to meet with King Manuel in Lisbon to petition that the community be emancipated. In Abrantes, King Manuel conferred a foral on 29 May 1507, elevating the settlement to the status of village (Portuguese: vila). Then, in 1522 an earthquake and landslide devastated the provincial capital, destroying many of the buildings and killing several people. Ponta Delgada became the only centre with an infrastructure to support the Azorean bureaucracy and supplant its important economic links. Quickly, its role changed, and eventually, it was elevated to status of city, during the reign of King D. João III by decree, dated 2 April 1546. The naval Battle of Ponta Delgada (also known as the Battle of São Miguel) took place on 26 July 1582, off the coast, as part of the 1580 Portuguese succession crisis. An Anglo-French corsair expedition sailed against Spain to preserve Portuguese control of the Azores, which had aligned itself with the pretender António, Prior of Crato, thereby preventing Spanish control (it was the largest French force sent overseas before the age of Louis XIV). During the 19th century the municipality experienced its greatest boost of economic activity, with the funneling of citrus exports to United Kingdom and the growth of foreign-owned businesses in the historic center, many of them Jewish merchants after 1818. As with other centres across the archipelago, the town of Ponta Delgada experienced many of the trends common for the period, including the "greening" of the communities (with the construction of the gardens of António Borges, José do Canto, Jácome Correia and the Viscount of Porto Formoso, which would become part of the University of the Azores), the construction of many of the ornate homes/estates, the clearing of animals from urban spaces, the opening of newer, larger, roadways, the moving of cemeteries to the periphery, and relocation of markets for fish, meat and fruits. Due to these changes, and growth of the mercantile class, Ponta Delgada became the third largest town in Portugal, in economic riches and the number of residents. The poet Bulhão Pato, writing of Ponta Delgada, was surprised by the extraordinary riches of the plantation owners, the "gentlemen farmers" that lived within the urbanized core: exporters of oranges and corn, bankers, investors, industrialists and shippers, all contributing to a privileged class of economic and social thinkers and philanthropists. At the beginning of the 20th century, Ponta Delgada's position was relatively high (eighth largest), although the changing importance of rural economies steadily chipped-away at its growth. But, it remained the central place in the economy and hierarchy of the Azorean archipelago. Consequently, it was at the forefront of political change following the Carnation Revolution. In one such event, property-owners and right-leaning farmers challenged the Civil Governor António Borges Coutinho, who was responsible, under the direction of the MFA government to implement land reforms. The Micalense Farmers' Protest, forced his resignation, and inspired a series of terrorist acts that plunged the Azores into political turmoil. After a clandestine round-up of arrests and detentions by the Military Governor, the Autonomous District of Ponta Delgada was extinguished, along with the other districts (Horta and Angra do Heroísmo) on 22 August 1975, with the establishment of the Junta Regional dos Açores (Regional Junta of the Azores), the provisional government that assumed the competencies of the administration during the region's transition to constitutional autonomy. The municipality of Ponta Delgada is one of the larger administrative divisions in the archipelago, extending from the center of the island to the western coast. Ponta Delgada is bordered on the northeast by the municipality of Ribeira Grande, and southeast by relatively new municipality of Lagoa. Geomorphologically, Ponta Delgada covers a volcanic area composed of two structures: the Picos Region and Sete Cidades Massif. The Picos Region extends from the shadow of the ancient volcano of the Água de Pau Massif (known locally for the lake that rests within its volcanic crater: Lagoa do Fogo) until the area around the Sete Cidades caldera. It is a volcanic axial zone oriented generally in a northwest-southeast direction, essentially defined by several spatter cones and lava flows and predominantly covered by dense vegetation and pasture-lands. Its relief is relatively planar, especially along the northern and southern coasts, where many of the urban communities are located. The Sete Cidades Massif, the other geomorphological structure that makes up the municipality of Ponta Delgada, consists of a central volcanic caldera and lake-filled cones which surround the crater. 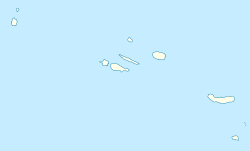 It occupies the extreme western part of the island, oriented along a similar northwest-southwest orientation, with many regional radial fractures marked by lava domes and spatter cones. The Sete Cidades Volcano at the center of the Massif consists of a caldera and a polygenetic volcanic field within it, that includes four lakes (two of which Lagoa Azul, the Blue Lake, and Lagoa Verde, the Green Lake, are linked). The caldera is almost circular and has evolved over the course of three phases. The first occurred 36,000 years ago forming the collapsed principal structure. The second phase conforms to a period approximately 29,000 years ago, when volcanic eruptions collapsed the northwest part of the structure. Finally, the third phase (about 16,000 years ago) caused the collapse of the north and northeastern portions of the caldera. Geologically, within the last 5,000 years, the central cone has been active (17 eruptions) and responsible for causing most of the activity in the archipelago, during that period. These geological eruptions were essentially trachyte eruptions of the sub-Plinian or Plinian type, with hydro-magmatic characteristics. The last eruption, at about 500 years ago, gave rise to the Caldeira Seca cone. Although there has been no historical activity today, its active status continues to be debated by the scientific community. Most recently, its diverse geography includes various types of basaltic volcanism, both effusive and less explosive (essentially Strombolian and Hawaiian) along its flanks, usually conditioned by local and radial faults. The Mosteiros Graben is also an important feature in this area, representing collapse of lands on the northwestern flank of the caldera. Although there are no active aerial volcanic characteristics (like the fumaroles of Furnas), submarine vents around the region of Ponta da Ferraria and the beach at Mosteiros have been identified. Being on the south coast of São Miguel Island, the climate is hot Mediterranean (Köppen: Csa), although it has a certain proximity to the humid subtropical (Cfa) and oceanic (Cfb), due to high levels of precipitation throughout the year combined with less sunshine, and because only one warm month just reaches 22.1 °C (71.8 °F). Although it does not meet the criteria of the main climatic classification used, the last climatic type is described by the municipal government with cool to warm summers and extremely mild winters for a marine west coast climate. Its location is one of the limits for pressure measurement to verify the North Atlantic Oscillation (NAO). The municipality's climate, much like the rest of the Azores, is shaped by the Gulf Stream allowing a small variation in temperatures. Under the Trewartha system it is well within the subtropical range. The Gulf Stream also contributes to an unstable weather that varies greatly during the autumn and spring, making weather forecasting on a daily basis difficult. Levels of humidity are significant enough (usually 90–100%) that temperatures fluctuations feel comparable to those experienced in locations on similar latitudes. Temperature differences between seasons are much smaller than those expected in continental Portugal, with milder winters and cooler summers than Lisbon. Much like other communities in the archipelago of the Azores, the municipality is shaped by its geography; most homes are clustered along the regional road network that circles the island, with many ancillary or agricultural access roads bisecting the central portion of the island (primarily in the Picos Region) along a north-south axis. Sete Cidades: located within the crater of the Sete Cidades Massif, the parish is bordered by twin lakes, and considered an ex-libris of the island of São Miguel. Along the southern coast is the urbanized core of the historic village/town of Ponta Delgada, which includes the principal civic infrastructures, high-capacity motorways (Portuguese: Vias-rápidas), tourist and culture attractions, as well as the businesses and government services. This city of Ponta Delgada includes specifically the civil parishes of Santa Clara, São José, São Sebastião and São Pedro, which is divided by the motorways with the urbanized contour of Fajã de Cima and Fajã de Baixo. Not to be confused with a traditional city, the city of Ponta Delgada has no legal jurisdiction or mayor, but the municipality of Ponta Delgada has an elected official, the Presidente da Câmara Municipal who administers and Assembleia Municipal, which is the representative council, while dispersed parish councils (and elected presidents) govern the localities that circle the western edge of São Miguel. The urban core includes the baixa or lower town, referring to the historic centre of buildings, shops and landmarks that gathered over the centuries around the square of São Sebastião and Praça Gonçalo Velho (dedicated to the island's discoverer). Immediately around this urban core are the municipal hall, the Gates to the City (Portuguese: Portas da Cidade) and old customhouse buildings in front of the main roadway that follows the coast (itself passing the Fort of São Brás and Campo do São Francisco in the west). Other important landmarks include the Portas do Mar (Gates of the Sea), main tower of the SolMar Avenida Center mall and Theatre Micalense. The municipality of Ponta Delgada presents a glimpse into the divergent economic activities that exist in the Azores. With a strong concentration of service activities, the municipality is an important industrial and agricultural centre. The Arrifes-Covoada basin is the main bread-basket on the island of São Miguel, in addition to all the parishes located around the rim of the Sete Cidades Massif. In 1999, 1039 companies had their operational seats within the borders of Ponta Delgada, roughly equal to 45.4% of the companies of the Azores. Of these companies, 4.4% were in the primary sector, 13.7% in secondary industries and 81.9% in the tertiary service sector. The volume of sales (in 2000) was equivalent to 1,458 million Euros, associated with the service industry, of which banking, computer programming/services, corporate and commercial services, as well as tourism, dominate. 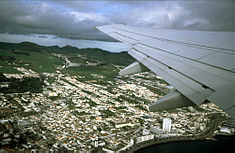 Tourist activity in Ponta Delgada accounted for 34% of the hotel occupancy in the region, of which 46% were overnight trips (1997). In addition, Ponta Delgada is the centre of administrative services in the region, with many of the governmental secretariats located in this municipal seat (including the Regional Presidency and several directorates). Several newspapers are published in Ponta Delgada, including Açoriano Oriental (one of the oldest continuing daily newspapers in the country) and the Diário dos Açores. Served by an international airport in the parish of Relva (Ponta Delgada-João Paulo II International Airport), the municipality is the principal port of entry for goods entering and people arriving in the Azores. SATA International and SATA Air Açores have their head offices in Ponta Delgada. Near the harbour of Ponta Delgada a broad gauge railway was used several times to build and enlarge the harbor. The track used a seven-foot gauge, but it is unclear if this was Isambard Kingdom Brunel's 7 ft (2,134 mm) Brunel gauge. Ponta Delgada is home to the central nucleus of the University of the Azores, a multi-disciplinary institution that ranges from courses in tourism, computer engineering, social sciences and business management. From its principal campus in São Pedro, the rectory manages three poles spread throughout the Azores, including Horta (with courses in Marine Biology, affiliated with the Department of Oceangraphy and Fishing) and Angra do Heroísmo (with a broad course calendar of courses in teaching, business and agricultural sciences). The image of the Lord Holy Christ of the Miracles: this venerable celebration is the largest and oldest religious event in Portugal. The front façade of the Convent of Our Lady of Hope, in Campo de São Francisco, during the events of The Lord Holy Christ of the Miracles. 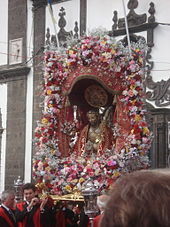 Ponta Delgada is the traditional centre of the annual religious celebrations associated with the Feast of the Lord Holy Christ of the Miracles (Portuguese: Festa de Senhor Santo Cristo dos Milagres), from the square Campo de São Francisco (located opposite the Fort of São Brás). This venerable feast day and week-long celebrations, primarily focus on the fifth Sunday of Easter, attracting locals and Micaelense, in addition to peoples from neighbouring islands in the archipelago, the Portuguese diaspora and tourists on vacation. Associated with the Roman Catholic veneration of a Ecce Homo representing Jesus Christ following the Passion (retold in Luke 23:1–25 in the New Testament), a gift to the sisters of the Convent of Caloura in the mid-16th century, the event, as it paralyzes the streets of the city for a day. Following the images move to the Convent of Nossa Senhora da Esperança (Convent of Our Lady of Hope), under the inspiration of the Venerable Mother Teresa da Anunciada the figure was used in religious processions that snaked through the streets of the city, stopping at each convent (and former-convent) in the city. The cortege, which includes clergy, politicians and lay folk is a popular event, attracting both religious (to the procession, sanctuary and open-air mass) and secular participants (to view and see the procession, imagery and taste traditional foods from the barracas located along the main avenue). Following Pentecosts, many of the parishes within the municipality participate in feasts dedicated to the Holy Spirit. A tradition across the islands of the Azores, the Cult of the Holy Spirit dates to medieval traditions, involving "promises" made to God (Portuguese: promessas), the processions of faith to and from the Church and feasts of meat-broth soup and bread donated to the poor. In comparison to other islands/parishes of the Azores, most neighbourhoods of São Miguel allow the free participation of visitors, seen as fulfilling the tenets of the tradition, rather than the narrow sub-community of the Brotherhoods of the Holy Spirit. One of the more popular non-religious events is the Noites de Verão (Nights of Summer): a summer event, traditionally held in the square of Campo do São Francisco, but in recent years dispersed throughout the streets of the city. Attracting families, friends and tourists to the downtown, highlighted by nightly musical events, popular Azorean bands/singers, guest concert bands, folklore groups and some international stars, in addition to vendor concessions selling food, refreshments or small goods. Starting usually in late June, the "Summer Nights" run until late September (four months), and is sponsored/supported by the municipal government and local/regional businesses. In addition to several parks providing green-spaces for multiple recreational activities, the city of Ponta Delgada is home to sporting associations and sites for racket sports, organized team and open-air activities. In addition to multiple water-sports, such as swimming, surf/board and canoeing/kayaking, there are cycling routes and spaces for running/walking. As centre of tourist activities, visitors to the region have access to tourist companies providing excursions to island trails, all-terrain paths and sea-oriented activities such as diving, sport-fishing and boat tours. Home to the Ponta Delgada Football Association, the region has a storied history of football, that includes teams that have made it to the 1st and 2nd Divisions of the National Football League. Among them are Club Desportivo Santa Clara (Primeira Liga), Clube União Micaelense, (Portuguese Second Division) and Marítimo da Calheta (São Miguel Regional Championship League). Fernance B. Perry (1921–2014) was a successful business entrepreneur, philanthropist and broadcast executive, recipient of the Order of the British Empire, who emigrated to Bermuda with his parents in 1926. 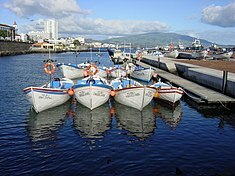 Wikivoyage has a travel guide for Ponta Delgada. ^ Ponta Delgada was once home to five Synagogues with the oldest surviving synagogue being the Sahar Hassamain Synagogue (Gates of Heaven) in downtown. ^ Bento, Carlos Melo (2 January 2008). "Roteiro do 6 de Junho de 1975 – A Vitória dum Povo" (in Portuguese). Ponta Delgada (Azores), Portugal. ^ Instituto Nacional de Meteorologia <Lisboa> Sonstige (2012). Atlas climatico de los Archipielagos de Canarias, Madeira y Azores temperatura del aire y precipitacion (1971 - 2000) = Atlas climatico dos Arquipelagos das Canarias, da Madeira e dos Acores : temperatura do ar e precipitacao (1971 - 2000) = Climate atlas of the Archipelagos of the Canary Islands, Madeira and the Azores : air temperature and precipitation (1971 - 2000). Inst. de Meteorologia. OCLC 1075426566. ^ "Clima Ponta Delgada: Temperatura, Tempo e Dados climatológicos Ponta Delgada - Climate-Data.org". pt.climate-data.org. Retrieved 17 April 2019. ^ "Prolongamento da Avenida Marginal de Ponta Delgada - 2ª Fase - Resumo" (PDF). Câmara Municipal de Ponta Delgada. ^ "PhD thesis - Andrew Harding 2006". crudata.uea.ac.uk. Retrieved 17 April 2019. ^ Sayers, David (2006). Azores: The Bradt Travel Guide. Bradt Travel Guides. ISBN 9781841621562. ^ "Normais Climatológicas – 1981–2010 (provisórias) – Ponta Delgada" (in Portuguese). Instituto de Meteorologia. Retrieved 18 March 2013. ^ "Weatherbase: Historical Weather for Ponta Delgade". Retrieved 18 March 2013. ^ "Ponta Delgada (08513) - WMO Weather Station". NOAA. Retrieved 17 April 2019. ^ "Geminações de Cidades e Vilas" (in Portuguese). Associação Nacional de Municípios Portugueses. Retrieved 13 February 2015. ^ a b c d e f g h i Câmara Municipal, ed. (2002). "Economia" (in Portuguese). São Sebastião (Ponta Delgada), Portugal: Câmara Municipal de Ponta Delgada. Archived from the original on 30 June 2011. Retrieved 19 June 2011. ^ "Customer Care Archived 8 June 2010 at the Wayback Machine." SATA. Retrieved on 7 July 2010. ^ "Press Kit 2010." SATA. Retrieved on 7 July 2010. "The SATA Group comprises air transport companies whose decision centre is located in the city of Ponta Delgada, on the island of São Miguel, in the archipelago of Azores." ^ Brady, Chris (30 March 2010). "The Broad Gauge Railway of the Azores". Retrieved 3 May 2011. Many harbour breakwaters were built using seven foot gauge railways. ... [The locomotives] were disposed of to places as diverse as Brixham and the Azores. ^ Churcher, Colin. "Broad Gauge Railway Relics in the Açores". Retrieved 3 May 2011. The story of the railway in Ponta Delgada, ... begins in Holyhead on the island of Anglesea in North Wales. ... the broad gauge of 7 feet 0¼ inches ... was that chosen by Isambard kingdom Brunel for the Great Western Railway. ^ Martins, Ana Maria Almeida (2006). "Figuras da Cultura Portuguesa: Antero do Quental" [Figures in Portuguese Culture: Antero de Quental] (in Portuguese). Lisbon, Portugal: Instituto Camões. Archived from the original on 16 January 2009. Retrieved 17 July 2010.